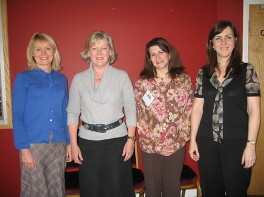 Liz Macann, Head of Coaching at the BBC, with Carol Wilson, Angela Dunbar and Wendy Oliver after delivering Transformational Change through Metaphor, an advanced coach training programme for the BBC. Personal development programmes to increase confidence, enhance management skills, and alleviate personal issues of stress and fear in the workplace. Clean techniques are welcomed by experienced and competent coaches required advanced training to stimulate and inspire their work; people with a willingness to try something different which goes beyond standard models, encompasses a different way of thinking to help the client explore their challenges, and an openness to a more psychological approach that involves working with clients at a deeper level, involving visualization, metaphor and trance work. Emergent Knowledge techniques are taught through demonstrations by the trainers, practice by the participants, plus plenty of discussions and debrief. Participants will experience the benefits of receiving EK coaching during the course, from the trainers and from each other. Between sessions, participants are paired up to practise with each other in order to embed the learning in a natural, productive and enjoyable way. Every participant will receive a detailed comprehensive reference manual detailing all the techniques learned on the course. Participants do not require previous training in either Clean Language or coaching skills as sufficient basic training is included in the course.